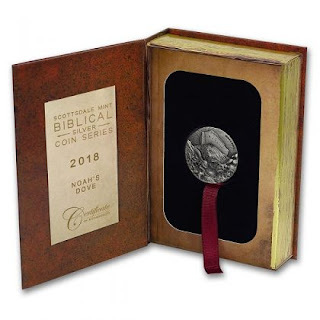 APMEX, Inc., the nation’s largest Precious Metals e-retailer, is thrilled to introduce the first 2018 release in the Scottsdale Mint’s famed Bible Coin Series. 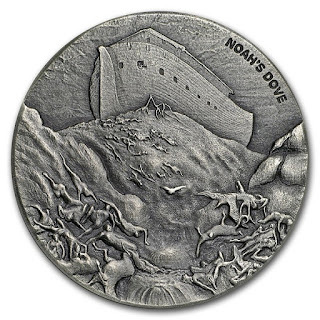 Similar to all previous releases in the series, this 2 oz coin is cast from .999 fine Silver with antique finishing and a high relief, rimless design. The reverse depicts Gustave Doré’s illustration of the ark atop the floodwaters. The obverse features the effigy of Queen Elizabeth IIsurrounded by the weight, face value and purity. The edge is engraved with the unique serial number, from 1 to 1499, given to each coin.